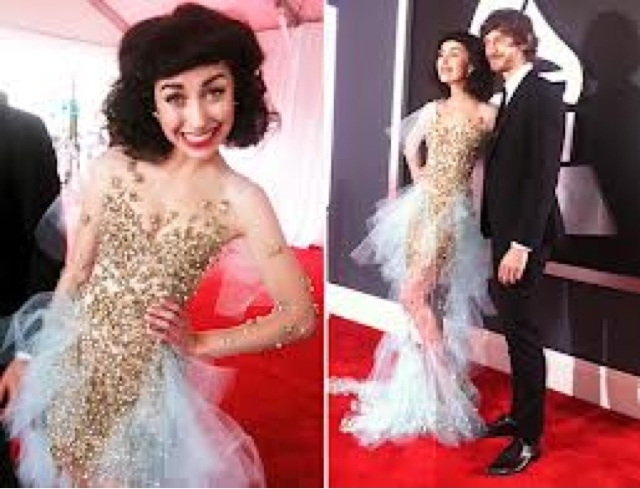 Poor Kimbra got totally slated on Fashion Police following her first appearance at the Grammys. I was super excited to see that she was even featured, but I guess with such a statement dress she was bound to get picked up by the fashion critics. Go Fug Yourself's Jessica was much kinder, letting Kimbra's cute enthusiasm beat out any desire to slander the dress. Tbh I didn't think it was that bad. Ok, totally out there, in a kind of playful spritely way, but we're talking about the awards show which saw Riri get rave reviews for wearing a deconstructed toilet brush and Lady Gaga turning up in an egg. So there's room for kook. I thought the dress was totally cute, it unfortunate that it coincided with everyone toning down their looks, due to new network requirements. In defence of Kimbra I would like to take it to the Fashion Police cadet who nominated her for worst dressed nominee, Queen G herself Giuliana Ransic. I love G, and she usually looks amazing, but this awards season she's got it so wrong. I think she's forgetting her place as a (laughably quote unquote) "reporter". Sorry G, I'll follow your baby-making troubles in NW, but you haven't actually achieved anything to be called a star. Anyway, take her Golden Globes gothic travesty. I don't like to judge, but anyone so obviously ano as Giuliana should really stay away from high neck lines. Anything that brings such close attention to your lollipop head should be off limits. That thing looks more unbalanced than a baby with a candy apple. Seriously G, eat a pie, and send Morticia Adamms thanks for the loan of her wedding dress. At least Kimbra looks like a fairy princess, not an emo Bratz doll. The Trashtastic Award feat. Who?